levied on balance 60% accumulated balance on NPS. Simillary 60% of accumulated interest of EPF contibuted on & after 01.04.2016 will be taxable at a time of its withdrawal. 3 Exemption Limit for Employer Contribution of SAF increases from Rs 100000/- to Rs 150000/- wef 01.04.2017.
for getting exemption u/s 24(b) in respect of Self Occupied House Property. whether the assessee is the owner of the property or not in that financial year. sub section (1) shall be allowed as deduction. This deduction is not available for the assessee who are getting HRA. 8 Additional surcharge 3% (12% to 15%) on individual having total income exceeds Rs. 1 crore. 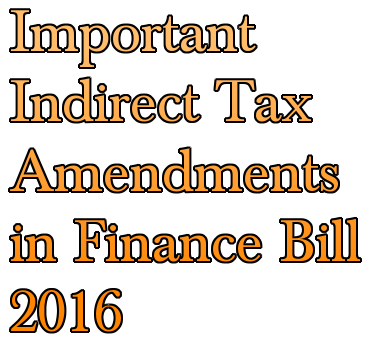 9 Thresold Limit for presumptive taxation u/s 44AD increase from RS.1 crore to 2 Crore. Taxpayer obtain the benefit u/s 44AD now requires to pay Advance Tax else liable to intrerest u/s 234B & 234C. they do not claim the benefit of acclerated depreciation & investment linked deduction. within 3 years from the date of approval under new inserted section 80IABA. provided amount of Loan & Value of property does not exceeds Rs 35 Lacs & 50 Lacs respectivelly.This benefit is over & above benefit specified u/s 24(b). 14 Gross divident received by Individuals , HUF & a Firm resident in india is taxable @10% if amount of such divident exceeds Rs.10 Lacs. 15 In order to provide relief to Non resident it is proposed that Sec 206AA is not applicable for Non Resident on furnishing the alternative documents. Tax Prayer shall be require to pay advance tax in 4 instalments, viz; 15%,45%,75% & 100% on or before 15th June,15th Sept,15th Dec & 15th March Respectivelly. 17 Any sum paid to Indian Railways for use of railway assets are covered u/s 43B . applicable only to a person resident in India. Section 115BBF is applicable both for existing as well as new patents. proposed to be reduced from 300 to 240 days & condition of 10% increase in total number of employees proposed to be withdrawn. 20 Belated Return u/s 139(5) must be filled before the end of relevant AY & completion of assessment whichever is earler & belated return can also be revised. Time limit for completion of assessment u/s 143 & u/s 147 reduced from 2 years to 21 months.